Want a confidential Strategy Session? Are your business relationships worth the 20 seconds it takes to convert hollow words to true CONNECTION? Your valuable time and energy are often wasted by simply plowing ahead with your intended message BEFORE the recipient is ready to react. Yet you may not have the time or interest to ...wait... for them to become more receptive. Learn how to immediately apply this powerful Business EMPATHY Tool that leverages only 20 seconds of your focus into a more significant relationship, ready to solve both current and future problems together faster. Extra bonus: this tool can also provide life-changing breakthroughs relating to family and friends, too! 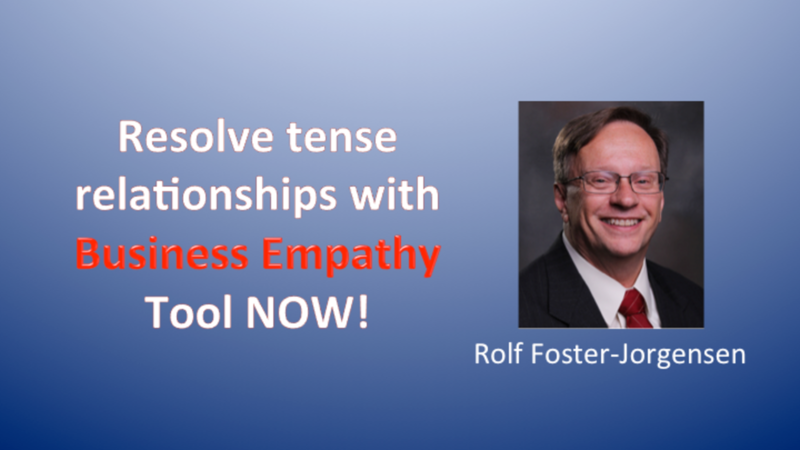 Watch the video by Rolf Foster-Jorgensen, founder of the Business Empathy Tool and 30+ year successful consultant, facilitator, trainer and coach for Fortune 500 and other clients. Then download your copy of the tool to keep handy near your computer and telephone for easy implementation whenever you want to TRANSFORM relationships into ACTION. Learn how to immediately apply the powerful Business EMPATHY Tool that leverages only 20 seconds of your focus into a more significant work and/or family relationship, ready to solve both current and future problems together faster. Once you purchase, Watch the video by Rolf Foster-Jorgensen, founder of the Business Empathy Tool and 30+ year successful consultant, facilitator, trainer and coach for Fortune 500 and other clients. Then download your copy of the tool for convenient access anytime. Did you find what you were looking for, or need more information? Happy to serve, including if you email [email protected] Thanks. To respect your privacy, please click the button below AND reply to the confirming email. For a limited time, I'm offering up to an hour of FREE "Insight and Strategy Session" High Performance Coaching once you complete a confidential questionnaire. Let's get started toward achieving a more satisfying and productive life.